Eyed through the lens of statistics, the DiMaggio diamond doesn’t reveal its true brilliance. His .325 lifetime batting average is impressive, but it doesn’t compare with that of Ty Cobb’s (.366) or the average of many other ballplayers. His 361 career home runs are less than half as many as Hank Aaron’s. And despite the Yankee Clipper’s reputation as a fielder, in more than one season his long-forgotten kid brother Dominic committed fewer errors. Then why did journalists in 1969 — with the memory of baseball giants Roberto Clemente, Hank Aaron, Mickey Mantle and Willie Mays so fresh—name DiMaggio the "Greatest Living Ballplayer?" How can as varied a cast of peers as Casey Stengel, who coached him, Ted Williams of the Boston Red Sox, who rivaled him in greatness, and Mantle, who replaced the Yankee Clipper in center field, all agree that he was not just good, but the best? Williams spoke for many when he said, "Joe was simply the greatest player I ever saw, as well as the most graceful." DiMaggio’s stature is undoubtedly enhanced by the man’s mystique. A man’s reputation is raised dramatically when he marries a Hollywood goddess and is immortalized, while still living, by a rock and roll poet. Nonetheless, the DiMaggio myth was carried on the shoulders of DiMaggio’s game. Those who saw him say he earned his title as "The Greatest" the old-fashioned way: play by play, game by game, and season by season. DiMaggio may not have dominated any one baseball category, but he excelled in them all. His old teammate Tommy Henrich puts it plainly: "He had no weaknesses." DiMaggio knew that there are five things a baseball player is paid to do: run the bases, catch a ball, throw a ball, hit a ball, and hit a ball a country mile. Cooperstown’s Hall of Fame has selected some players for merely doing one of these things well. DiMaggio was superb at all five. For example, Joltin’ Joe swung hard to hit the long ball, yet he didn’t strike out, an anomalous combination in baseball. Most great players perfect one or the other. Cincinnati Red Pete Rose, one of the great hitters of the last 25 years, struck out rarely by not swinging for the fences. The number of home runs and strike outs by Babe Ruth were both prodigious. In contrast, DiMaggio’s 361 career home runs were met with only 369 strike outs, a one-to-one ratio. Until his last year, DiMaggio was more likely to hit a home run than to strike out. In contrast, today’s baseball slugger Sammy Sosa strikes out about three times for every home run he hits, which is almost expected of many power hitters. DiMaggio’s many talents were pushed to their limit by a perfectionist’s intensity. 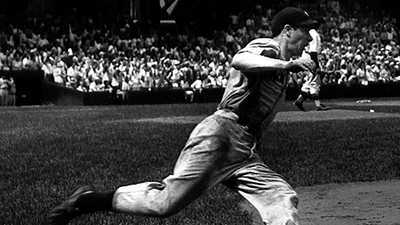 One teammate, outfielder Charlie Keller, remembers watching the veins in the DiMaggio’s neck bulge as he waited, his entire body coiled in anticipation for a pitch from the great pitcher Bob Feller. Henrich says that even DiMaggio’s slides were ferocious. "He was the roughest, hardest slider," remembered Henrich. "He would hit the ground harder than anybody else." Premier baseball writer Roger Angell, in a March, 1999 profile in The New Yorker, described DiMaggio’s play this way: "No one else brought such presence and quiet command to the hard parts of the game, or is remembered by all who saw him play as being engaged in a private vision of his work that was offered daily for our pleasure." Late in his career, DiMaggio was asked why he hustled on a play that meant little in a game that had little bearing on the Yankee’s fate that year. "Because there is always some kid who may be seeing me for the first time," DiMaggio explained. "I owe him my best." This was perhaps DiMaggio’s career credo, a personal statement of his abiding work ethic. Some of the Yankee Clipper’s amazing abilities were not even tested. The great Yankee manager Joe McCarthy, who was there when DiMaggio first came to the Yankees, said that DiMaggio might have stolen 60 bases a season if he had been allowed to run the bases freely. DiMaggio’s breadth of skills was carried from one season to the next by his consistency. He entered the league on fire and would have left the same way if not for his final season. ("I hit .263," DiMaggio said. "I remember that average better than the good ones.") DiMaggio hit in 56 consecutive games in 1941 (a mythic record in the game) and 61 games while in the minor leagues, both benchmarks of daily consistency. His consistency was surely born from physical prowess, but it was also rooted in a mental toughness that author Richard Ben Cramer identifies as a "constant critical awareness." Cramer, who interviewed many of DiMaggio’s former teammates, says they talk about what he didn’t do as often as what he did do. The Great DiMaggio was legendary for never throwing to the wrong base, getting thrown out on the base paths, or misjudging a fly ball. 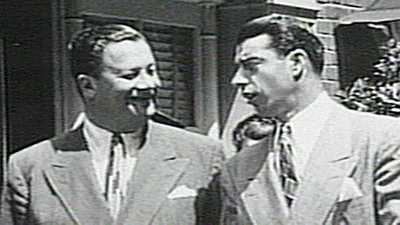 Asked to comment on his one-time star at a DiMaggio gala, the then-ancient McCarthy stood and spoke just one sentence before sitting: "Joe was one ballplayer who never made a mental mistake." Frank "Spec" Shea, another former Yankee teammate of DiMaggio’s, remembers DiMaggio lecturing his teammates after one crucial loss. DiMaggio told his teammates, "We had mental mistakes today. We had ’em yesterday. I don’t want no more." DiMaggio’s concentration only seemed to sharpen in the World Series. His career batting average soared from .325 in regular season games to a staggering .425 in 10 years of World Series play. DiMaggio’s consistency impresses even more when you consider his twisted ankles, the bone spurs in his feet that required surgery, a shoulder that dislocated routinely and a bad back that also went under the knife. This series of injuries dogged DiMaggio from his first game until his last. His caliber of play not only impressed others, it inspired them. "Without saying a word, he led the Yankees to championships year after year after year," said former teammate Jerry Coleman. "We wanted to perform like DiMaggio," he said. "Because of that. . . you push yourself harder." Phil Rizzuto, former DiMaggio teammate who was later an announcer for the Yankees, said the man came to represent hope: "You’d just see him and you knew you had a pretty good chance to win." These are not just partisan opinions; they were proved over the arc of his career. Perhaps the greatest proof is the great rivalry between the Yankees and Red Sox in the twilight of DiMaggio’s career. Each spring from 1947 through 1951, "Sporting News" chose the Red Sox to win the pennant. The Sox were thwarted each time, in large part because of DiMaggio’s ability to rally his team late in a season and late in a game. One of DiMaggio’s great clutch performances came in 1949. For the eighth time in eleven seasons, DiMaggio didn’t open the season. This time the culprit was a bone spur in his right heel. DiMaggio was depressed not only by his inability to play but by the recent death of his father. His ulcers flared up. But then, in mid-June, the pain in his heel subsided. DiMaggio determined to return for a key three-game series in Boston against the Red Sox, who hoped to whittle down the Yankees’ five-game, first-place lead. 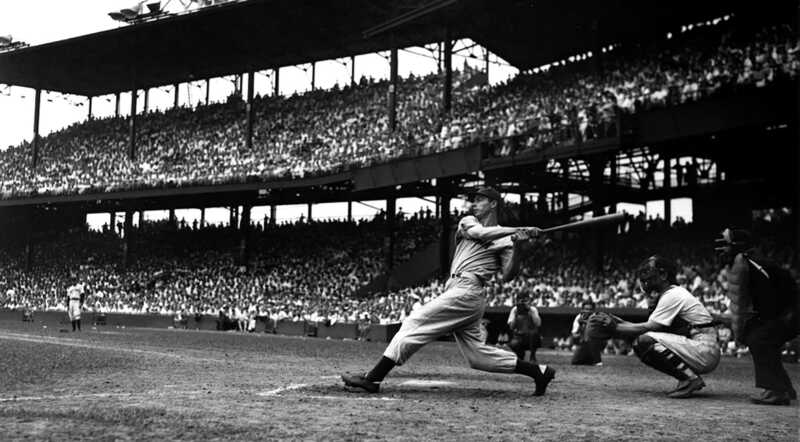 Having only watched the game for over a month, DiMaggio hit a remarkable four homers in three games. He almost single-handedly swept the series, adding another notch to his reputation as an invincible player. "I’m just a ballplayer with only one ambition: to give all I’ve got to help my club win," DiMaggio said. "I’ve never played any other way." He achieved his ambition, winning more championships than even Babe Ruth. DiMaggio might have been a loner, but when it came to baseball, he was the ultimate team player. "Fifty-six is a helluva good record," he said of his hitting streak long after it was over. "But the thing that’s most important to me is that we won ten pennants and nine world titles in my thirteen years." That’s a record that the greatest players on the greatest teams, including Michael Jordan, Joe Montana and Wayne Gretzky, can’t touch. "I can tell you Hall of Famers that people think are better than DiMaggio," argues Henrich. "But if you want to play a game of ball and win at the end of nine innings, take Joe. That’s what I loved about him." In his retirement, DiMaggio would go on to sell his signature to the highest bidder, hawk a coffee-making machine, and chase a blur of blondes. But for those who saw him play, it didn’t matter. They watched him perform stoically through pressure and pain in the place he felt most at home: Yankee Stadium, baseball’s greatest stage. There, the place of baseball legend, the world watched DiMaggio do what so many mortals fail to do. The Great DiMaggio won — and he did it with grace. 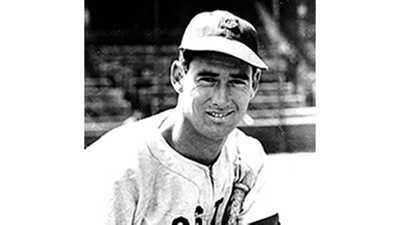 If there was a baseball player who rivaled DiMaggio in his day, it was undoubtedly Ted Williams. Quite appropriately, he died wanting to walk out one more time on to the green grass that was the center stage of his life: Yankee Stadium.